Decompression obligation for a given dive profile must be calculated and monitored to ensure that the risk of decompression sickness is controlled. Some equipment is specifically for these functions, both during planning before the dive and during the dive. Other equipment is used to mark the underwater position of the diver, as a position reference in low visibility or currents, or to assist the diver's ascent and control the depth. Decompression may be shortened (or accelerated) by breathing an oxygen-rich "decompression gas" such as a nitrox blend or pure oxygen. The high partial pressure of oxygen in such decompression mixes produces the effect known as the oxygen window. This decompression gas is often carried by scuba divers in side-slung cylinders. Cave divers who can only return by a single route, can leave decompression gas cylinders attached to the guideline at the points where they will be used. Surface supplied divers will have the composition of the breathing gas controlled at the gas panel. Divers with long decompression obligations may be decompressed inside gas filled hyperbaric chambers in the water or at the surface, and in the extreme case, saturation divers are only decompressed at the end of a tour of duty that may be several weeks long. Equipment for planning and monitoring decompression includes decompression tables, surface computer software and personal decompression computers. There is a wide range of choice. A decompression algorithm is used to calculate the decompression stops needed for a particular dive profile to reduce the risk of decompression sickness occurring after surfacing at the end of a dive. 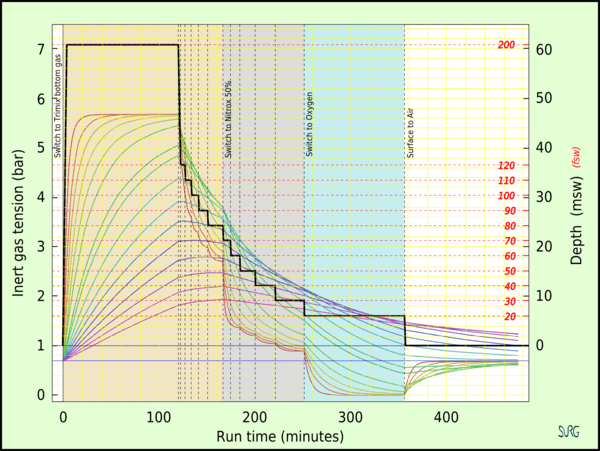 The algorithm can be used to generate decompression schedules for a particular dive profile, decompression tables for more general use, or be implemented in dive computer software. During the 1980s the US recreational diving community tended to move away from the US Navy tables to a range of tables published by other organisations, including several of the diver certification agencies (BSAC, NAUI, PADI). Depending on the table or computer chosen the range of no-decompression limits at a given depth on air can vary considerably, for example for 100 fsw (30 msw) the no stop limit varies from 25 minutes to 8 minutes. It is not possible to discriminate between "right" and "wrong" options, but it is considered correct to say that the risk of developing DCS is greater for the longer exposures and less for the shorter exposures. The choice of tables for professional diving use is generally made by the organization employing the divers. For recreational training it is usually prescribed by the certifying agency, but for recreational purposes the diver is generally free to make use of any of the published tables, and for that matter, to modify them to suit himself or herself. Dive tables or decompression tables are tabulated data, often in the form of printed cards or booklets, that allow divers to determine a decompression schedule for a given dive profile and breathing gas. With dive tables, it is generally assumed that the dive profile is a square dive, meaning that the diver descends to maximum depth immediately and stays at the same depth until resurfacing (approximating a rectangular outline when drawn in a coordinate system where one axis is depth and the other is duration). Some dive tables also assume physical condition or acceptance of a specific level of risk from the diver. Some recreational tables only provide for no-stop dives at sea level sites, but the more complete tables can take into account staged decompression dives and dives performed at altitude. 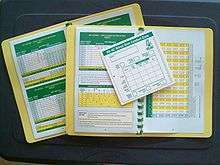 The PADI recreational dive planner, in "Wheel" format. The Recreational Dive Planner (or RDP) is a set of devices marketed by PADI with which no-stop time underwater can be calculated. The RDP was developed by DSAT and was the first dive table developed exclusively for recreational, no stop diving. There are four types of RDPs: the original table version first introduced in 1988, The Wheel version, the original electronic version or eRDP introduced in 2005 and the latest electronic multi-level version or eRDPML introduced in 2008. The low price and convenience of many modern dive computers mean that many recreational divers only use tables such as the RDP for a short time during training before moving on to use a diving computer. Decompression software such as Departure, DecoPlanner, Ultimate Planner, Z-Planner, V-Planner and GAP are available, which simulate the decompression requirements of different dive profiles with different gas mixtures using decompression algorithms. Decompression software can be used to generate tables or schedules matched to a diver's planned dive profile and breathing gas mixtures. The usual procedure is to generate schedules for the intended profile and for the most likely contingency profiles, such as slightly greater depth, delayed ascent and early ascent. Sometimes an emergency minimum decompression schedule and a more conservative schedule will be generated to allow the diver further options. V-Planner runs the variable permeability model, developed by D.E. Yount and others in 2000, and allows the choice of VPM-B and VPM-B/E, with six conservatism levels (baseline plus five incrementally more conservative ones). GAP allows the user to choose between a multitude of Bühlmann-based algorithms and the full reduced gradient bubble model, developed by Bruce Wienke in 2001, in its five conservatism levels (baseline, two incrementally more liberal and two incrementally more conservative). The personal decompression computer, or dive computer, is a small computer designed to be worn by a diver during a dive, with a pressure sensor and an electronic timer mounted in a waterproof and pressure resistant housing and which has been programmed to model the inert gas loading of the diver's tissues in real time during a dive. Most are wrist mounted, but a few are mounted in a console with the submersible pressure gauge and possibly other instruments. A display allows the diver to see critical data during the dive, including the maximum and current depth, duration of the dive, and decompression data including the remaining no decompression limit calculated in real time for the diver throughout the dive. Other data such as water temperature and cylinder pressure are also sometimes displayed. The dive computer has the advantages of monitoring the actual dive, as opposed to the planned dive, and does not assume on a "square profile" – it dynamically calculates the real profile of pressure exposure in real time, and keeps track of residual gas loading for each tissue used in the algorithm. Dive computers also provide a measure of safety for divers who accidentally dive a different profile to that originally planned. 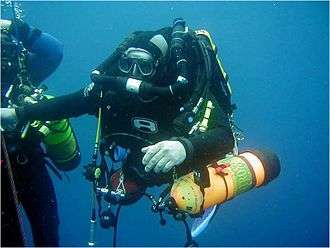 If the diver exceeds a no-decompression limit, decompression additional to the ascent rate will be necessary. 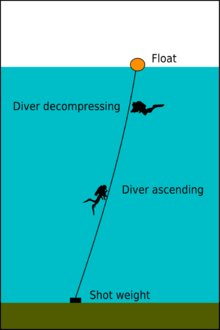 Most dive computers will provide the necessary decompression information for acceptably safe ascent in the event that the no-decompression limits are exceeded. The use of computers to manage recreational dive decompression is becoming the standard and their use is also common in occupational scientific diving. Their value in surface supplied commercial diving is more restricted, but they can usefully serve as a dive profile recorder. The personal decompression computer provides a real time modelling of the inert gas load on the diver according to the decompression algorithm programmed into the computer by the manufacturer, with possible personal adjustments for conservatism and altitude set by the user. In all cases the computer monitors the depth and elapsed time of the dive, and many allow user input specifying the gas mixture. Most computers require the diver to specify the mixture before the dive, but some allow the choice of mixture to be changed during the dive, which allows for the use of gas switching for accelerated decompression. A third category, mostly used by closed circuit rebreather divers, monitors the partial pressure of oxygen in the breathing mix using a remote oxygen sensor, but requires diver intervention to specify the inert gas constituents and ratio of the mix in use. The computer retains the diver's pressure exposure history, and continuously updates the calculated tissue loads on the surface, so the current tissue loading should always be correct according to the algorithm, though it is possible to provide the computer with misleading input conditions, which can nullify its reliability. This ability to provide real-time tissue loading data allows the computer to indicate the diver's current decompression obligation, and to update it for any permissible profile change, so the diver with a decompression ceiling does not have to decompress at any specific depth provided the ceiling is not violated, though the decompression rate will be affected by the depth. As a result, the diver can make a slower ascent than would be called for by a decompression schedule computed by the identical algorithm, as may suit the circumstances, and will be credited for gas elimination during the slower ascent, and penalized if necessary for additional ingassing for those tissues affected. This provides the diver with an unprecedented flexibility of dive profile while remaining within the safety envelope of the algorithm in use. Ratio decompression (usually referred to in abbreviated form as ratio deco) is a technique for calculating decompression schedules for scuba divers engaged in deep diving without using dive tables, decompression software or a dive computer. It is generally taught as part of the "DIR" philosophy of diving promoted by organisations such Global Underwater Explorers (GUE) and Unified Team Diving (UTD) at the advanced technical diving level. It is designed for decompression diving executed deeper than standard recreational diving depth limits using trimix as a "bottom mix" breathing gas. It is largely an empirical procedure, and has a reasonable safety record within the scope of its intended application. Advantages are reduced overall decompression time and for some versions, easy estimation of decompression by the use of a simple rule-based procedure which can be done underwater by the diver. It requires the use of specific gas mixtures for given depth ranges. The advantages claimed are flexibility in that if the depth is not known accurately, the schedule can be adjusted during the dive to allow for the actual depth, and that it allows deep dives without the use of an expensive trimix dive computer. Limitations include that a consistent set of gases must be used which match the specific ratio model, and the specific ratio will only be relevant to a limited range of depths. As the parameters move away from the base conditions, conservatism will diverge, and the probability of symptomatic bubble formation will become more unpredictable. There is also the requirement for the diver to do mental arithmetic at depth to calculate the parameters of a safety-critical operation. This may be complicated by adverse circumstances or an emergency situation. A shot line is a rope between a float at the surface, and a sufficiently heavy weight holding the rope approximately vertical. The shot line float should be sufficiently buoyant to support the weight of all divers that are likely to be using it at the same time. As divers are seldom weighted to be very negatively buoyant, a positive buoyancy of 50 kg is considered adequate by some authorities for general commercial use. Recreational divers are free to choose lesser buoyancy ay their own risk. The shot weight should be sufficient to prevent a diver from lifting it from the bottom by over-inflation of the buoyancy compensator or dry suit, but not sufficient to sink the float if the slack on the line is all taken up. Various configurations of shot line are used to control the amount of slack. The diver ascends along the shotline, and may use it purely as a visual reference, or can hold on to it to positively control depth, or can climb up it hand over hand. A Jonline may be used to fasten a diver to an anchor line or rope during a decompression stop. A decompression trapeze is a device used in recreational diving and technical diving to make decompression stops more comfortable and more secure and provide the divers' surface cover with a visual reference for the divers' position. It consists of a horizontal bar or bars suspended at the depth of intended decompression stops by buoys. The bars are of sufficient weight and the buoys of sufficient buoyancy that the trapeze will not easily change depth in turbulent water or if the divers experience buoyancy control problems. Trapezes are often used with diving shots. 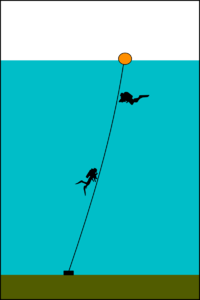 When diving in tidal waters at the end of slack water, the trapeze may be released from the diving shot to drift in the current as the divers make their decompression stops. A shotline with a lazy shot – a second float with a short weighted line tethered to it at just below the depth of the deepest long decompression stop. 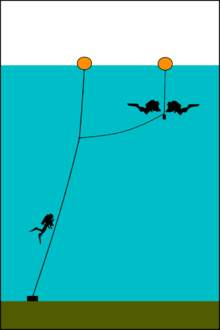 A shotline with a decompression trapeze – a series of crossbars suspended from a float at each end and ballasted as necessary, tethered to the main shotline. A delayed or deployable surface marker buoy (DSMB) is a soft inflatable tube which is attached to a reel or spool line at one end, and is inflated by the diver under water and released to float to the surface, deploying the line as it ascends. This provides information to the surface that the diver is about to ascend, and where he is. This equipment is commonly used by recreational and technical divers, and requires a certain level of skill to operate safely. Once deployed, it can be used for the same purposes as the standard surface marker and reel, and in the same way, but they are mostly used to signal the boat that the diver has started ascent or to indicate a problem in technical diving. A wet bell, or open bell, is similar to a diving stage in concept, but has an air space, open to the water at the bottom in which the divers, or at least their heads, can shelter during ascent and descent. A wet bell provides more comfort and control than a stage and allows for longer time in the water. Wet bells are used for air and mixed gas, and divers can decompress using oxygen from a mask at 12 m.
Technical divers preparing for a mixed-gas decompression dive in Bohol, Philippines. Note the backplate and wing setup with side mounted stage tanks containing EAN50 (left side) and pure oxygen (right side). Reducing the partial pressure of the inert gas component of the breathing mixture will accelerate decompression as the concentration gradient will be greater for a given depth. This is achieved by increasing the fraction of oxygen in the breathing gas used, whereas substitution of a different inert gas will not produce the desired effect. Any substitution may introduce counter-diffusion complications, owing to differing rates of diffusion of the inert gases, which can lead to a net gain in total dissolved gas tension in a tissue. This can lead to bubble formation and growth, with decompression sickness as a consequence. Partial pressure of oxygen is usually limited to 1.6 bar during in water decompression for scuba divers, but can be up to 1.9 bar in-water and 2.2 bar in the chamber when using the US Navy tables for surface decompression, and up to 2.8 bar for therapeutic decompression. Open circuit scuba divers by definition are independent of surface supply, and must take any gas mixture with them that is to be used on the dive. However, if they are confident of returning by a specific route, the decompression gas may be stored at appropriate places on that route. The cylinders used for this purpose are called stage cylinders, and they are usually provided with a standard regulator and a submersible pressure gauge, and are usually left at the stop with the regulator pressurized, but the cylinder valve turned off to minimize the risk of gas loss. Similar cylinders are carried by the divers when the route back is not secure. They are commonly mounted as sling cylinders, clipped to D-rings at the sides of the diver's harness. Scuba divers take great care to avoid breathing oxygen enriched "deco gas" at great depths because of the high risk of oxygen toxicity. To prevent this happening, cylinders containing oxygen-rich gases must always be positively identifiable. One way of doing this is by marking them with their maximum operating depth as clearly as possible. Other safety precautions may include using different coloured regulator housing, flavoured mouthpieces, or simply placing a rubber band vertically across the mouthpiece as an alert. Surface supplied divers may be supplied with a gas mixture suitable for accelerated decompression by connecting a supply to the surface gas panel and connecting it through the valve system to the divers. This allows accelerated decompression, usually on oxygen, which can be used to a maximum depth of 20 ft (6 m) in water for scuba and 30 ft (9 m) on surface supply. Surface supplied heliox bounce divers will be provided with mixtures suitable for their current depth, and the mixture may be changed several times during descent and ascent from great depths. 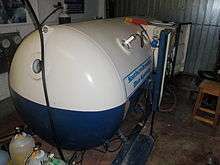 A deck decompression chamber (DDC), or double-lock chamber is a two compartment pressure vessel for human occupation which has sufficient space in the main chamber for two or more occupants, and a forechamber which can allow a person to be pressurised or decompressed while the main chamber remains under constant pressure. This allows an attendant to be locked in or out during treatment of the occupant(s) of the main chamber. There is usually also a medical lock, which serves a similar function but is much smaller. This is used to transfer medical material, food and specimens into and out of the main chamber while it is under pressure. Most deck decompression chambers are fitted with built in breathing systems (BIBS), which supply an alternative breathig gas to the occupants (usually oxygen), and discharge the exhaled gas outside the chamber, so the chamber gas is not excessively enriched by oxygen, which would cause an unacceptable fire hazard, and require frequent flushing with chamber gas (usually air). A deck decompression chamber is intended for surface decompression and emergency hyperbaric treatment of divers, but can be used for other hyperbaric treatment under the appropriate supervision of hyperbaric medical personnel. Portable or mobile one and two occupant single compartment chambers are not generally intended for routine surface decompression, but may be used in an emergency. Personnel Transfer Capsule, or Dry bell. Part of a saturation system: On the left is a part of the living space with a medical lock in the foreground. To the right is the wet-room, on the top of which there is a flange to which the wet bell is bolted for transfer of the divers between the hyperbaric habitat and the bell. A "Saturation System" or "Saturation spread" typically includes a living chamber, transfer chamber and submersible decompression chamber, which is commonly referred to in commercial diving and military diving as the diving bell, PTC (Personnel Transfer Capsule) or SDC (Submersible Decompression Chamber). The system can be permanently placed on a ship or ocean platform, but is more commonly capable of being moved from one vessel to another by crane. The entire system is managed from a control room (van), where depth, chamber atmosphere and other system parameters are monitored and controlled. The diving bell is the elevator or lift that transfers divers from the system to the work site. Typically, it is mated to the system utilizing a removable clamp and is separated from the system tankage bulkhead by a trunking space, a kind of tunnel, through which the divers transfer to and from the bell. At the completion of work or a mission, the saturation diving team is decompressed gradually back to atmospheric pressure by the slow venting of system pressure, at rates of about of 15 to 30 msw (50 to 100 fsw) per day, (schedules vary). Thus the process involves only one ascent, thereby mitigating the time-consuming and comparatively risky process of multiple decompressions normally associated with non-saturation ("bounce diving") operations. The chamber gas mixture is typically controlled to maintain a nominally constant partial pressure of oxygen of between 0.3 and 0.5 bar during most of the decompression (0.44 to 0.48 bar on US Navy schedule), which is below the upper limit for long term exposure. NOAA has used rather different saturation decompression schedules for relatively shallow (less than 100 fsw) air and nitrox saturation dives, which use oxygen breathing when pressure is reduced to less than 55 fsw. 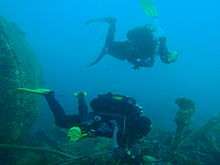 The divers use surface supplied umbilical diving equipment, utilizing deep diving breathing gas, such as helium and oxygen mixtures, stored in large capacity, high pressure cylinders. The gas supplies are plumbed to the control room, where they are routed to supply the system components. The bell is fed via a large, multi-part umbilical that supplies breathing gas, electricity, communications and hot water. The bell also is fitted with exterior mounted breathing gas cylinders for emergency use. The divers are supplied from the bell through umbilicals. A hyperbaric lifeboat or hyperbaric rescue unit may be provided for emergency evacuation of saturation divers from a saturation system. This would be used if the platform is at immediate risk due to fire or sinking, and allows the divers under saturation to get clear of the immediate danger. A hyperbaric lifeboat may be self-propelled and can be operated by crew while the while the occupants are under pressure. It must be self-sufficient for several days at sea, in case of a delay in rescue due to sea conditions. The crew would normally start decompression as soon as possible after launching. 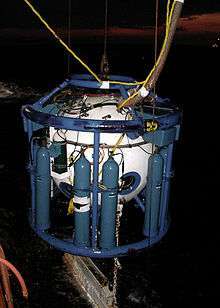 A dry bell may also be used for bounce dives to great depths, and then used as the decompression chamber during the ascent and later on board the support vessel. In this case it is not always necessary to transfer into a deck chamber, as the bell is quite capable of performing this function, though it would be relatively cramped, as a bell is usually as small as conveniently possible to minimize weight for deployment. ↑ Van Liew, Hugh D; Bishop, B; Walder, P; Rahn, H (1965). "Effects of compression on composition and absorption of tissue gas pockets". Journal of Applied Physiology. 20 (5): 927–33. ISSN 0021-8987. OCLC 11603017. PMID 5837620. ↑ Staff (13 April 2010). "Using multiple cylinders". Sport Diver (online magazine). PADI. Retrieved 3 March 2016. ↑ Huggins, KE (2012). "Dive Computer Considerations: How dive computers work". Proceedings of the Validation of Dive Computer Workshop convened by the Baromedical and Environmental Physiology Group of NTNU on August 24, 2011, at the 37th Annual Meeting of the European Underwater and Baromedical Society in Gdansk, Poland. NTNU and the Norwegian Labour Inspection Authority. Retrieved 6 March 2016. ↑ Bühlmann Albert A. (1984). Decompression–Decompression Sickness. Berlin New York: Springer-Verlag. ISBN 0-387-13308-9. ↑ Bühlmann, Albert A (1995). Tauchmedizin (in German). Berlin: Springer-Verlag. ISBN 3-540-55581-1. ↑ Bühlmann, Albert A (1992). Tauchmedizin: Barotrauma Gasembolie Dekompression Dekompressionskrankheit (in German). Berlin: Springer-Verlag. ISBN 3-540-55581-1. ↑ "British RNPL Decompression tables" (PDF). Royal Naval Physiological Laboratory. 1972. Retrieved 2 March 2016. ↑ Adkisson, G (1991). "The BS-AC '88 decompression tables". South Pacific Underwater Medicine Society Journal. 21 (1). Retrieved 2012-01-10. 1 2 Hamilton Jr RW, Rogers RE, Powell MR (1994). "Development and validation of no-stop decompression procedures for recreational diving: the DSAT recreational dive planner". Tarrytown, NY: Diving Science & Technology Corp. Retrieved 2008-06-15. ↑ Nishi, RY; Tikuisis, P (1996). "Current Trends in Decompression Development: Statistics and Data Analysis". Defence R&D Canada Technical Report. DCIEM-96-R-65. Retrieved 2012-01-10. ↑ Duis, D. (1991). "Using the Recreational Diver Planner for multi-level diving". In: Hans-Jurgen, K; Harper Jr, DE (eds.) International Pacifica Scientific Diving ... 1991. Proceedings of the American Academy of Underwater Sciences Eleventh Annual Scientific Diving Symposium held 25–30 September 1991. University of Hawaii, Honolulu, Hawaii. Retrieved 2011-10-17. ↑ Staff (2008). "Introducing the eRDPML". Big Blue Technical Diving News and Events: Archive for August 4, 2008. Big Blue Technical Diving. Retrieved 7 March 2016. ↑ Huggins, KE. "Performance of dive computers exposed to profiles with known human subject results" (PDF). Catalina Hyperbaric Chamber, Wrigley Marine Science Center University of Southern California,. Retrieved 6 March 2016. ↑ "Departure – Dive Planning and Decompression software". Diverssupport.com. Retrieved 2012-07-17. ↑ "DecoPlanner, decompression simulation software". Gue.com. Retrieved 2012-07-17. ↑ "GAP-software, decompression simulation software". Gap-software.com. 2008-02-10. Retrieved 2012-07-17. ↑ Lang, M.A. ; Hamilton, Jr R.W. (1989). Proceedings of the AAUS Dive Computer Workshop. United States: USC Catalina Marine Science Center. p. 231. Retrieved 2008-08-07. 1 2 3 4 5 6 7 Boan, Charlotte (2014). "How to deploy a shotline". Dive magazine archive. Syon publishing. Retrieved 3 March 2016. ↑ Edmonds, Carl; Bennett, Michael; Lippmann, John; Mitchell, Simon (2 July 2015). "Equipment for recreational diving". Diving and Subaquatic Medicine, Fifth Edition (5, illustrated, revised ed.). CRC Press. p. 45. ISBN 978-1-4822-6013-7. Retrieved 7 March 2016. ↑ "Technical Issues". Newry & Mourne Sub Aqua Club. Retrieved 2009-08-28. ↑ Staff (2005–2016). "Surface Marker Buoys (SMBs)". Scuba Doctor website. Melbourne: The Scuba Doctor Australia. Retrieved 7 March 2016. 1 2 Staff. "Recommendations Concerning the Use of Surface Marker Buoys" (PDF). British Diving Safety Group. Retrieved 7 March 2016. ↑ Staff (2015). "Delayed surface marker buoy". BSAC Safe Diving. British Sub-Aqua Club. p. 18. Retrieved 7 March 2016. ↑ Nawrocky, Pete (2014). "We're Over Here!". Alert Diver online, Spring 2014. Divers Alert Network. Retrieved 7 March 2016. ↑ Staff. "Diving Launch And Recovery Systems". Commercial Diving Equipment. Submarine Manufacturing & Products Ltd. Retrieved 7 March 2016. ↑ Staff. "Pommec 2 diver launch and recovery system with diving basket" (PDF). Technical Diving Equipment. Pommec BV. Retrieved 7 March 2016. 1 2 Jablonski, Jarrod (2006). "Details of DIR Equipment Configuration". Doing it Right: The Fundamentals of Better Diving. High Springs, Florida: Global Underwater Explorers. p. 113. ISBN 0-9713267-0-3. 1 2 3 Beyerstein, G (2006). Lang, MA; Smith, NE, eds. Commercial Diving: Surface-Mixed Gas, Sur-D-O2, Bell Bounce, Saturation. Proceedings of Advanced Scientific Diving Workshop. Smithsonian Institution, Washington, DC. Retrieved 12 April 2010. ↑ US Navy Diving Manual Revision 6, chpt. 15 sect. 23 pp 33 seq. ↑ James W. Miller, ed. (1979). "12.6 Decompression after an air or nitrogen-oxygen saturation dive". NOAA Diving Manual (2nd ed.). United States Department of Commerce. ↑ Staff (May 2013). "Guidance on Hyperbaric Evacuation Systems" (PDF). Guidance on Hyperbaric Evacuation Systems IMCA D 052 May 2013. International Marine Contractors' Association. Retrieved 6 March 2016. Huggins, Karl E. (1992). "Dynamics of decompression workshop". Course taught at the University of Michigan. Retrieved 2012-01-10. US Navy (2008). US Navy Diving Manual, 6th revision. United States: US Naval Sea Systems Command. Retrieved 2008-06-15.